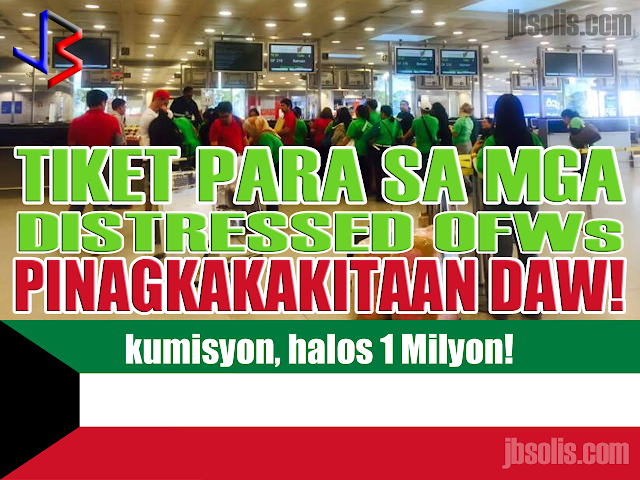 OFWs and manpower agencies in Kuwait are calling for OWWA and DOLE to investigate an alleged repatriation ticket scam happening in Kuwait, whereby a single person is allegedly earning a fortune on mass repatriation tickets referred to a specific agency or airline (PAL). 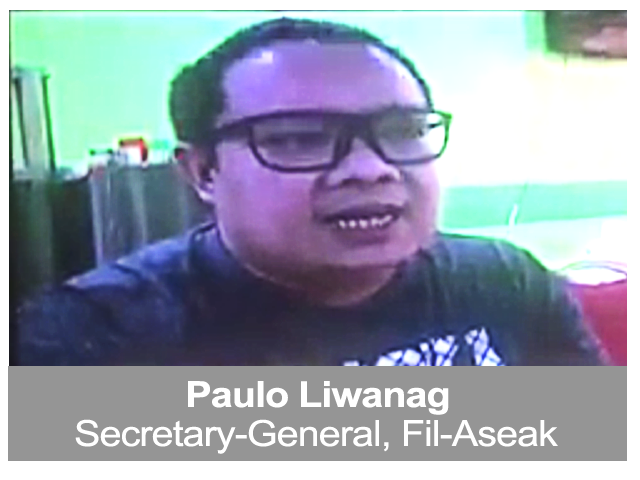 The person being accused is Paulo Liwanag, secretary general of Fil-Aseak, a Kuwait-based NGO tasked by the POLO-OWWA Office to contact manpower agencies regarding the mass repatriation of OFWs based in Kuwait. Among the complainants are two secretaries working for different manpower agencies. Manpower agencies are required by Philippine law to shoulder the repatriation tickets of distressed OFWs that these agencies have deployed. The complainants alleged that Paulo Liwanag bypassed the agencies and booked the distressed OFWs himself, and profiting in the process. The agencies say that the ticket prices are inflated by as much as 15 Kuwaiti Dinars or equivalent to almost 2,500 pesos! They claim that there are cheaper airlines that they can choose. Liwanag's defense is that he has given enough notice to manpower agencies. He further said that he never pressured people to book tickets through him. He also said that some people "confirm" (their booking) through him, so this is what he sends (books) to Philippine Airlines. A travel agency, one that used to provide repatriation tickets through Paulo Liwanag, confirms part of the allegation. In an interview, Paulita Lundang said Paulo Liwanag asked for a commission of 5 Kuwaiti Dinar per ticket, equivalent to 850 pesos. She however did not see anything wrong with it as she thought that Paulo used the commission for his NGO-related expenses like cellphone load, splitting the amount with a certain "Jones". Lundang estimates that within a year, Paulo received about 6,000 Kuwaiti dinar from her agency. That amounts to 985,000 pesos! Mr. Liwanag disputes this statement from Paulita Lundang citing that she has no evidence showing Liwanag receiving any amount of money from Lundang. He goes further, saying the 5 Kuwaiti dinar per head was actually a promise from Lundang, and that she never delivered on that promise. He insists that he never received anything or any amount of money from Paulita Lundang. 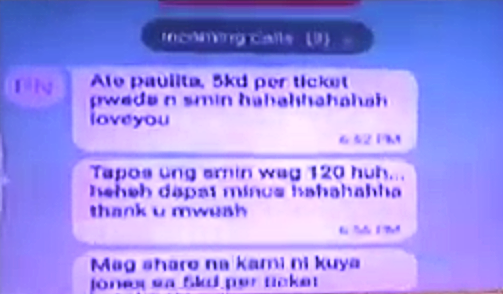 Paulita Lundang shows text messages from Paulo Liwanag, where the 5KD per ticket commission is being arranged. Paulo Liwanag believes that Paulita Lundang is now speaking against him because she lost the mass repatriation (agreement or contract). Paulita Lundang points to the CCTV camera when confronting Paulo Liwanag on camera, pressuring him to admit to receiving commission from repatriation tickets. Paulita Lundang counters, speaking directly to Paulo "here is the cctv camera in my office.. you and Jones immediately come here, after the workers (OFWs) have been repatriated, to collect your commission. If I were you, admit it. Why would you say you never received (money)? All the proof are here. I only never asked for you to sign (receipt of money) due to trust. Count the number of repatriates, multiply by 5 Kuwaiti dinars, that's our agreement and I abided by that. The Kuwait situation has been a huge problem for the Philippine government. That is why President Duterte is mulling a ban on deployment of Household Service Workers to Kuwait. Due to the scandal between Liwanag and Lundang, the Mass Repatriation Ticket arrangements were transferred directly to the airline company PAL. The airline management deny giving commission to Liwanag, saying they follow a standard fare rate. They also allege that a number of manpower agencies have not even paid their dues up to now. The Kuwait POLO Office explains that they do not have any knowledge of the transactions between Liwanag and Lundang. They themselves have informed the manpower agency secretaries to go directly to airlines when it comes to repatriation tickets. Nestor Burayag of the POLO Office Kuwait further stated that in order to facilitate the repatriation process, an internal arrangement exists between POLO Kuwait and Philippine Airlines. The agreement says that PAL will issue tickets on the same day that POLO sends a request, so that the repatriation papers can be submitted to the Kuwaiti authorities immediately on the next day for approval. Nestor Burayag explains the arrangement between POLO Kuwait and Philippine Airlines. Mr. Burayag also clarifies Paulo Liwanag's role in the Mass Repatriation of distressed HSWs. He states that there is no direct authorization on the part of Mr. Liwanag. What exists is a coordination between POLO Kuwait and Fil-Aseak, in giving assistance to Mass Repatriation. Burayag assures that Paulo Liwanag does not have strong connections in POLO-OWWA. As of publication, the OWWA Main Office and the DOLE have not issued a statement on the matter. We also sent a message to Fil-Aseak through their facebook page, to get their side of the story.